At Fine Framers, we regularly do all sorts of object framing. One of our favourites is when we’re asked to design a custom-made medal holder. We know we’re doing it for a person who’s proud of what they have achieved, in sports or other pursuits. Sometimes, it’s the person themselves who comes to us. Sometimes, it’s family members seeking a medal holder as a thoughtful gift. The common factor is that we can always deliver a perfect solution: attractively laid out, expertly framed, and all set to hang proudly for many years to come. We recently had such a quest from a proud Kilkenny man. 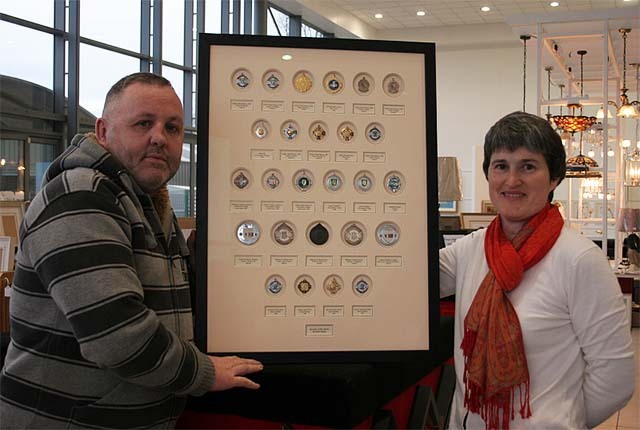 Brendan Smyth accumulated a fine collection of medals from hurling, gaelic football, and soccer over the years. His haul included Kilkenny county medals with Cloneen (hurling) and Railyard (football), as well as Inter-Firms medals with Glanbia and soccer medals from the Carlow & Kilkenny District Leagues. The collection spanned three decades – from his underage and Community Games days, up to when he was classed as a veteran. He brought us 26 medals in total, and asked us to come up with a custom framed medal holder for them. We were delighted to do so. Our staff member Yvonne (pictured above with Brendan) took charge of this project. She first collected full details of what each medal was for and when it was won, in order to produce display labels for each. She next spent some time working on the layout. Once Brendan was happy with it, we proceeded to the actual framing. We first mounted the medals themselves and their associated labels on a sturdy backboard. We then took an overlay with carefully-measured and accurately-placed cut-outs, and placed it around them to provide spacing between the objects and the glass that would cover them. The frame itself was in Brendan’s choice of material, and all was fully sealed to prevent moisture or other harmful elements from seeping in and causing damage over time. Brendan was delighted with the result, and the framed medal holder now hangs proudly on a wall of his home. Layout is fully customisable – you are not restricted to the pre-set layout of an ‘off the shelf’ medal holder. So having 26 medals when an ‘off the shelf’ layout only allows for 25 won’t be a problem! If you’d like to talk to us about a medal holder, then we’d love to talk to you too. Just call us at 059 9135645, use our contact form, or call in to see us. You’ll find us in the Wexford Road Business Park, on the outskirts of Carlow.